We are working to improve animal welfare in the community and support the people who live in it. 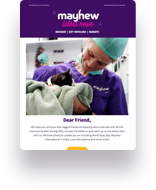 Mayhew is more than an animal rescue shelter. Our community support projects range from controlling feral populations to rescuing abandoned animals. We also recognise that animal welfare issues and social welfare issues are linked. We work to protect the vital bond vulnerable people, the elderly, the homeless and those suffering from mental health issues have with their animals. And by taking our educational initiatives out to the community, we have a better chance of preventing cases of neglect, abandonment and cruelty. Our approach: building trusting relationships with people in the local community to ensure we are the first contact in their time of need. We have a team of animal welfare officers who are out in the community every day. They provide ongoing support to pet owners in difficulty, assist animals in need, and deliver a range of community initiatives across London. Get in contact with our Animal Welfare Officers by email at awo@mayhewanimalhome.org or call them on 020 8962 8000. We have been a lifeline for the homeless and rough sleepers for over 17 years. Find out more about our work with people and dogs on the street in London. Our programme for feral cats in London helps to control and contain the cat population. We provide shelter and care for the pets of people in crisis for short periods of time. We collect and neuter owned cats or dogs within our designated catchment area. Our Animal Welfare Officers rescue abandoned or mistreated animals every day. We run a number of educational programmes for young people in the community. Guides to help you with your pet.